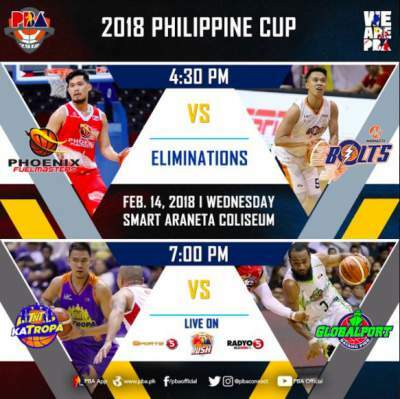 Here is the details for TNT Katropa vs. Globalport Batang Pier in the elimination round of 2018 PBA Philippine Cup. Six players scored at least 10 points for the Globalport Batang Pier, who outplayed the TNT KaTropa on the way to a 99-84 victory. Nico Elorde played his best game in league, registered 17 points, seven rebounds and seven assists for Global port. Stanley Pringle, Bradwyn Guinto, Yousef Taha, Jonathan Grey and Kelly Nabong added double-digit outputs. Jason Castro's 24 points and Kelly Williams' 21 markers carried TNT. Watch the highlights of the Globalport Batang Pier 99-84 win over the TNT Katropa on February 14.